Teresa Taylor is a nationally recognized executive who brings integrity, focus, vision and agility to corporate leadership. She has earned a reputation for building and managing cohesive teams, inspiring loyalty, managing through conflict and embracing change. Teresa is the former Chief Operating Officer of Qwest, a Fortune 200 telecommunications and media company. During her tenor, she directed the strategy and daily operations of 30,000 people in field support, technical development, sales, marketing, customer support and IT systems in India and the United States. T-Mobile USA, Inc. (NYSE:TMUS) a Fortune 100 wireless provider with over 14 million subscribers. She chairs the Compensation Committee and is the Lead Independent Director. NiSource, Inc. (NYSE:NI) a Fortune 500 energy holding company that provides storage and transmission for natural gas and electricity. She serves on the Finance Committee, Corporate Governance Committee and Officer Nomination and Compensation Committee. First Interstate BancSystem, Inc. (Nasdaq:FIBK) a financial services holding company, headquartered in Billings Montana with $7.3 billion in assets. She serves on the Executive Committee and the Technology Committee, while also chairing the Compensation Committee. Recently, Teresa harnessed her experience as a COO of a Fortune 200 company and a mother of two sons to write her inspiring book, The Balance Myth: Rethinking Work-Life Success. A complete list of Teresa’s Board of Director positions and accolades are listed below. In addition, please download her full resume here. Teresa Taylor is a nationally recognized Fortune 200 executive who brings integrity, focus, vision and agility to corporate leadership, while advising companies, government agencies and others on a successful business model. 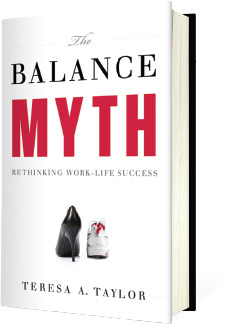 Her book, The Balance Myth: Rethinking Work-Life Success is inspiring women to succeed professionally and personally.